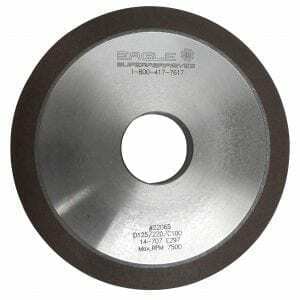 Eagle Superabrasives in a premier supplier of high-performance glass grinding wheel and diamond wheel products with a variety of bonds to choose from. We use the correct bonds for the job, and can produce wheels on more than six different ore materials. Whether you’re looking for a grinding wheel to cut glass or a tougher wheel to cut through difficult to grind (DTG) materials, our extensive inventory of 6,000 grinding wheel products will be sure to meet your needs. Ninety-percent of orders are on location at our Hickory, NC, headquarters and are ready for same-day shipping. We can even fill custom orders in as little as seven days. Don’t settle for subpar Superabrasives; contact the experts at Eagle Superabrasives for all your grinding needs. Glass grinding and ceramic grinding has been around for many years allowing for perfection in the smallest details of the wheel. One of the most important details to pay attention to when choosing a glass grinding wheel is the bond that is used. In order for your wheel to grind glass and ceramics effectively, the wheel must be made with a bond that is extremely abrasion resistant. Glass and ceramic grinding produces abrasive fines that break down the wheel by eroding the bonds. Our experts have developed a glass grinding wheel bond that helps counter this premature erosion of the wheel, by incorporating a metal based bond. Our advanced bonding system and formulations used will ensure that your glass grinding wheel last longer to increase your productivity and save you money. We offer wheels that are designed to cut and grind materials such as scientific glass, laminated glass, toughened glass, stemware, optical glass, Mirror and sheet beveling. Our wheels are made to order, so whether you’re grinding refractory materials that need grit sizes ranging from D100 to D4000 or a another other grit size required to grind more technical ceramics we can produce a wheel to fit your needs. Glass grinding causes friction that heats the wheel and producing grinding fines that erode the wheel. To combat heat and particle build up on your tool and grinding wheel, we recommend grinding under a flood coolant. The flood coolant will aid in the removal process of grinding swarf and to prevent the clogging of the wheels pores. When you’re ready to try the best, trust the experts at Eagle Superabrasives. Our experienced staff will provide support and advice along the way. With unparalleled customer service, super products and fast shipping, Eagle Superabrasives is an easy choice for all your grinding needs. Contact us today to place an order!